Home schools across the country. 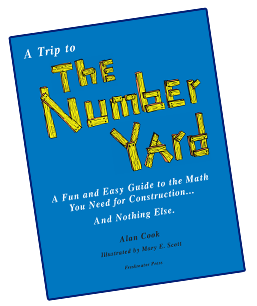 The Number Yard is the basis for remedial or construction math classes that are designed to have 6-16 classroom hours. A PowerPoint presentation containing over 100 slides is available on CD (the document is 50.6 MB and is not easily sent via email). There is no cost for the CD if making a volume purchase of books. If purchased as a stand alone item, the cost is $20 plus sales tax (if applicable) and shipping. (Must inquire directly to info@thenumberyard.com).